Facing the advancing years can have its ups and downs. On one hand, you will relish the accomplishments and life lessons through the years. On the other, you hurdle the challenges of health and age-related limitations. These are realities that won’t be much of a hassle when accepted wholeheartedly. On the brighter side, there’s always help accessible especially when you call for assistance from a provider of Home Health Care in Reynoldsburg, Ohio. For seniors like you, accidents at home cannot be avoided. Even if you’re getting help and assistance, emergencies can still happen. For this reason, having someone who can easily administer first-aid treatment is a must. The Cardiopulmonary resuscitation (CPR) is one of these must-have first-aid skills that your home health aide should have. Falls are unfortunately common in seniors like you. When an elderly person gets into a fall accident, they can be injured or fractured, which can result in more major complications such as being bedbound or disabled. When your home health aide is CPR-trained, they also know the basics of providing first-aid treatments in these instances. They can quickly send for help and do the necessary intervention while waiting for an emergency response to arrive. Cuts and bruises can also happen at home. These are sensitive occurrences for seniors who have diabetes since wounds can take time to heal. Knowledge of first-aid can help prevent further complications of these small wounds, thus protecting you from unnecessary infection. Heart attacks are like robbers, except that they stealthily steal not your cash but your health and at worse, your life. When heart attacks occur, the CPR-trained aide will know what to do. They can also notice the symptoms such as the evidence of pain on your face, the shortness of breath, and profuse sweating. Once they detect this or when you fall unconscious, they can intervene earlier with CPR. Going outdoors is a necessary activity for seniors, but the sun’s heat can pose some problems. There’s the risk for sunstroke or heatstroke. However, if your companion is trained in CPR, they can easily detect the symptoms for this condition and administer the proper intervention. Also, if you will fall unconscious due to heat stroke, they can apply CPR while waiting for the emergency help to arrive. Your overall health will still encounter other challenges at home besides these four reasons. But having a capable caregiver can prevent the worse-case scenario from occurring. As you look for care and assistance at home, consider this qualification. 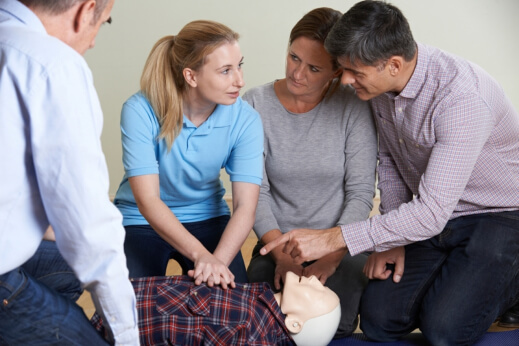 Aside from providing STNA Training in Columbus, Ohio, we also provide training for CPR and other basic life support activities at FRONTIER HEALTH CARE SERVICES LLC. This way, you can trust that getting our services can provide you and your loved one that reliable support at home when you need it. Set an appointment with us so you will know how we can be of help to you. This entry was posted in Home Health Care and tagged CPR-trained, Home Health, STNA Training. Bookmark the permalink. We are an agency that provides both medical and non-medical care services to our patients in their homes, depending on their specific home health needs. We also provide staffing solutions to employers, as well as provide employment opportunities to qualified healthcare personnel. Engage in our services today! You can easily reach us through the following channels. We look forward to discussing your healthcare options with you!